You see these large, thin gold restrikes on the bourse floor. They weigh over .44 oz and sell for about 12% over spot. They are very familiar to Europeans. In fact, they have been popular for over a hundred years as convenient and recognizable restrikes. Just as the Austrian empire of 1914 clung to the vestiges of the Holy Roman Empire which was disbanded by the Congress of Vienna a hundred years earlier, the medieval look and feel of these bullion issues invested them with a traditional grace that was at once delicate and stable. And yet, there is nothing so mysterious as the familiar. A Guide Book of United States Coins by R. S. Yeoman; Senior Editor, Kenneth Bressett; Valuations Editor, Jeff Garrett; Research Editor, Q. David Bowers, (2nd Edition; Whitman Publishing, 2011, 380 pages $29.95) may permanently establish this Professional Edition series as the new standard "Red Book" for collectors. The old one we all know from the mass distributions will remain handy for beginners, convenient to carry to the bourse floor and mark up with pens and highlighters, and eventually discard or retire to a box. But for the serious collector of American numismatics, the Professional edition is the book to own. It is not just that the values listed are only for the most worthy collectibles - no sense wasting space on Buffalo Nickels in Good-4 - though there is that. The true value here is in the text, the narrative, the story behind the story, the bibliography, the tidbits that make collecting fun and profitable. According to this book, it is generally known in the marketplace that the top tier grading certification companies are more liberal with Early American Copper than are the stalwarts of EAC, Inc. Here for all issues - gold, silver, copper; commemoratives; proofs; and bullion - is the inside information for professionals missing from the little Red Books we started with. Not in this book are Hard Times Tokens, Civil War Tokens, Pioneer Gold, and Colonials. This is about the mainstream of the modern US hobby today. The pages are large (8 1/2 x 11-inch format). The spiral binding lets it lay flat when folded. This is a book for a dealer at auction and every collector deserves that level of awareness to satisfy that depth of interest in today's marketplace. Even though gold strikes in the Appalachians brought branch Mints in Dahlonega and Charlotte, the gold dollar is the child of California's bounty. Gold dollars were last struck in 1889. The "Crime of '73" might have been the first indication, but finally, the United States went on the gold standard officially on March 4,1900. In that fifty years, America was transformed. The gold dollar was issued from 1849 to 1889, first from Philadelphia (of course) but also from Charlotte, Dahlonega and New Orleans (1849) before coming from San Francisco in 1859. Following the Civil War, the only branch Mint issue was the 1870-S.
For those who own the first edition, the second offers mostly new price tables. The dramatic drop in the dollar relative to gold pushes up the value of these truly numismatic items. The commonest of them - the 1856-P and 1862-P in Very Fine sell for two or three times their bullion value -- but that bullion value cannot be ignored as it affects the purist. Collectors new to these issues, or numismatists interested in their history, will find the new 2nd edition, a ready reference to the intricacies of errors and varieties. For each coin, there is an sub-section on "Characteristics of Striking and Die Notes" in addition to a sub-section of "Numismatic Notes." At these price levels, care and consideration are rewarded. Even if your initial goal is only a Year and Mint set, knowing the details, knowing the varieties, will bring special rewards later. 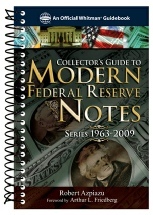 The Collector’s Guide to Modern Federal Reserve Notes Series 1963-2009 by Robert Azpiazu, (Forward by Arthur L. Friedberg; Whitman Publishing, 2010; 428 pages, $29.95) is a detailed taxonomy of our most common currency. Not surprisingly, these are also the most popular collectibles in paper money, according to Q. David Bowers. We say that “coins are history you can hold in your hand” and these bank notes document the panorama of our age. Secretary of the Treasury John Connally was governor of Texas and was wounded during the Kennedy Assassination. Secretary of the Treasury Lawrence W. Summers became the president of Harvard University. John W. Snow is now the CEO of Cerberus Capital Management, the firm that runs the Chrysler bailout. In our time, every Treasurer of the United States has been a woman. Like all numismatic items, these modern collectibles include obscure varieties and arcane errors. Radar notes, repeaters, and low numbers all command special values. And for all of these the Star Note may be the first hallmark of success for the new collector. With this book as your guide, the money in your wallet will take on new dimensions of meaning. This heightened awareness will reflect back on your perceptions of those Obsoletes and Nationals that were the mainstream of an earlier time. 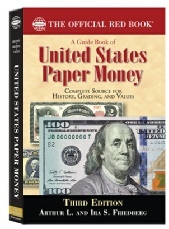 A Guide Book of United States Paper Money by Arthur L. and Ira S. Friedberg (3rd Edition; Whitman Publishing, 2011; 405 pages; $24.95) is a full-color guide to the history of our Republic as recorded on its fiduciary obligations, the paper money of the Treasury and Federal Reserve. For those with a passion for culture, (and especially for political process), this handbook is a convenient index to the panorama of America's growth and development. Legal Tender Notes (not backed in anything but faith in the federal government's ability to withstand its most severe test). Here, too, are the "Coin Notes" the promises of the Treasury to redeem its paper for hard money, as well as Demand Notes and Compound Interest Notes. In every case - from those to the National Bank Notes, Large Size Notes, Silver Certificates, and Gold Certificates - the artistic achievements were nothing short of stunning for the time and place. Two different vignettes feature Pocahontas. It is easy to find the other great names of American history. Following the leads to track down the other portraits opens the door to many enjoyable hours for the explorer. Any aficianado will recognize Stephen Decatur, but this can be an opportunity to learn about Thomas A. Hendricks and Gen. George H. Thomas. Today, no living person can be on U.S. money. (There was an exception in 1995.) That was an ad hoc rule in the wake of a small scandal; and you will find that story in the section on Fractional Currency. In fact, the first of these notes display men who were alive at the time, among them, Salmon P. Chase, who, as Chief Justice of the Supreme Court stood behind the money he created as Secretary of the Treasury. The easy assertion that federal paper money began with the Legal Tender Notes of 1862 is not exactly correct. In fact, the War of 1812 was paid for with paper. Interestingly, millions of dollars worth of all that is still unredeemed, held by collectors today as thousands of notes issued for hundreds of dollars each. And you will find them listed in this book.